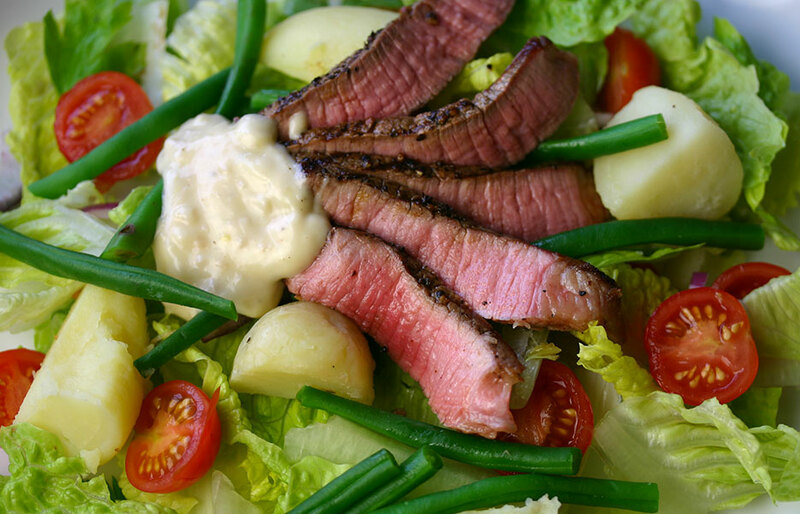 I consider this steak salad to be the summer version of a roast beef dinner – grilled meat, roast potatoes, steamed green beans, and a horseradish-based dressing to dollop on top. I often make it with boiled potatoes, but as our stove top was condemned(!) by the gas man a few days ago, that wasn’t an option. I serve the tomatoes, beans and onions in a large bowl; the meat and potatoes in another; and the dressing on the side. This works visually and also prevents the warm ingredients from making the fresh vegetables limp. It also cuts down on complaints from the girls, who are still “learning to like” horseradish – which is what I always say about those foods they currently shun. Rub the garlic into the meat, drizzle with oil, season and set aside. Roast or boil the new potatoes until cooked. Steam the green beans for a few minutes, then plunge into cold water to stop them cooking further. In a serving bowl, combine the beans, tomatoes and red onion. Heat the barbeque or grill, and cook the steaks to your liking. Set aside to rest for a few minutes before slicing thinly. Whisk together all the dressing ingredients in a small bowl, and season to taste. For each portion of salad, arrange a layer of the tomato-bean-onion mixture. Top this with a few potatoes and some slices of steak.